In my profession, we use our body of intellectual knowledge to make complicated concepts understandable to the uninitiated. However, there is an irony to being part of this elite body of scholars. Just what does it mean to have a Ph.D. or to be a Doctor of Philosophy? How does this level differ from perhaps a Master's degree? More importantly, how does it relate to chess? The More you Learn... the Less you Know? In all honesty, a vast body of technical knowledge is only starting point to learning and NOT an end in itself. Some professors are a bit high-headed because they feel that because they have mastered a subject, that they have mastered life. Let me say, as a caveat, that a Ph.D. in a particular subject does not mean that one has a Ph.D. in life skills. Having these credentials only allows you to enter into specific debates about the reality we find ourselves in. In the 6½ years of my Ph.D. process, I found that the more I learned, the more questions I had. It would seem to be the reverse… the more you learn, the less questions. Alas! When one begins to raise a series of endless questions, this is where knowledge is created. There is a unique power in a question because it initiates the search for the truth and understanding. It also demonstrates the level of one's understanding. Why do I say this since if one is asking questions, then they must not know? However, one MUST know something in order to know which questions to ask! Questions are ever-powerful and demonstrate critical thought. One of the main differences between one with a Ph.D. and one with a Master's degree is that the "good doctor" asks more precise questions. Let us refer to a chess analogy. Imagine the difference between a chess Grandmaster and an average Master chess player… who will ask better questions in any given position?? We all arrive at positions on the board and we go through an assessment, but it is the Grandmaster who will know which questions to ask and which route to take given a particular set of conditions. I remember reading GM Alexander Kotov's books Think Like a Grandmaster and Play Like a Grandmaster as a teenager and they made an impression on me. One of the interesting parts of the latter book was the internal dialogue that occurred when the Grandmaster was contemplating the "trees of analysis." In this book, Kotov demonstrated the mind of a Grandmaster and their process of thought. In the given diagram, we will note that the Grandmaster asks a number of questions in his analysis. Follow the internal dialogue from the position on the right. "What do I do here? His king is badly placed, but I still have to exploit that. I have the d- and f-files, a strong knight at d4. Must hurry before he can slip away with the king to safety at b8. His last move was rook to e4 attacking the knight. Defend it by 25.Qf2? He'll go Rd8. No, then I go 26.Qf6+ winning. So he'll go Qg5 or Qe5 centralizing, and then what do I have? Wait a minute. What about 25.Nf5+? He has no choice, takes and I go Rxf5. Then he can't take rook--mate on d6 by the queen. But he doesn't have to take. What do I have after Qc6 or Qc7? A piece gone. What about 25.Rf5 instead? Well we are playing for mate, so a rook down wouldn't matter if it's sound. 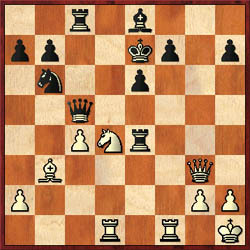 Kotov-Yudovich, 1939 USSR Championship… from the book Play Like a Grandmaster. If his queen moves then Qg5+ with a powerful attack. Nor can he meet the rook sac by e5, since we go Qg5+ Kf8, Ne6+. So he has to take the rook and I take on f5 with knight, check. Then his king is drawn forward. But what if he doesn't take? Say Qd6; but then I win the queen by Rxf7+ Bxf7, Nf5+. So he definitely has to take, and then I must have something. An interesting position! So, 25. Rf5 exf5 26.Nxf5+ Kf6 (26...Ke6 makes no difference) 27.Rd6+. Two lines. Takes the knight or rook blocks. If 27...Re6 the win is easy: 28.Qg7+ Kxf5 29.Bc2+ and now 29…Kf4 20.Qg3 mate, or 29…Re4 Qf6+ Kg4 31.Bd1+ and mate next move. So there remains 27. Kxf5. Then what did I see? Oh yes! 28.Qf3+ Rf4 (28…Kg5 and white wins simply, 29.Qf6+ Kh5 30.Bd1+ Rg4 31.Qh6 mate) 29.Qh5+ Ke4 30.Bc2+ Ke3. Can he really get away safe from there? No, there's 31 Rd3+ and wherever he goes 32. Rd2+ and mate by 33.Qe2. It's all there. Just check once more. How do I stand on the clock? Ten minutes left. I'll check again. After all it's a forced win, so time trouble won't matter too much." While sifting through the morass of decisions in the given positions, how many questions did Kotov raise? I have presented this excerpt from Kotov's book to demonstrate just how many questions the Grandmaster had to make when executing his idea. However, he had the experience and know-how to ask the right questions in the given position. It is common to hear a chess novice ask, "How many moves can you see ahead?" Of course, this is not a precise question, because it really isn't the most important thing in chess. It is possible to see ten moves deep in the wrong variation, or two moves deep in the right variation. Which one is better? In the Kotov example, we saw this theory applied to chess. 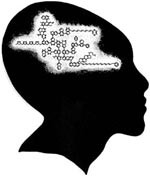 In chess, there are other factors that enter into the equation such as psychology. GM Nikolai Krogius wrote a classic book called The Psychology of Chess where he detailed many of the factors that affect the thought process outlined above. Factors such as culture, religion, social environment, temperament, and educational attainment will impact how one approaches a problem. One interesting comment was made in an interview with GM Maurice Ashley on the difference between Grandmasters and other players. He contrasted the ideas of thinking on principle with ideas of thinking on the truth. "The truth is more important than the principles. I think a lot of players are guided by principles… two Bishops are good, Rook on an open file, doubled pawns are bad, don't leave the King in the center. I think a big difference between Grandmasters and lower-rated players is that those principles are only guidelines… they're not the truth. They may help you to get to the truth, but a lot of times they can stand in your way of understanding the truth… Joel Lautier said to me long ago… Russians Grandmasters consider initiative more important than anything else. Initiative dictates the flow of the game. That may mean having what seems to be a poor pawn structure, giving up the two bishops, or any host of things… you have to find the move that speaks to the position." Of course, the knowledge as articulated by GM Ashley in the interview points to nothing other than a particular line of thought. The fact that a player feels that initiative dictates the flow of the game will affect how they think about a given position. With a different line of thought, the types of questions you ask in the position will also be different. In the final analysis, the quality of thought is determined by the quality of information you receive which is improved by the type of questions one raises. Questions provoke thinking… critical thinking. Daaim Shabazz, "Metaphysics of the Chess Mind," Jan-Feb 2003. "The Mind of a Grandmaster," Sep-Oct 2002. Mark Bowen, "Lateral Thinking in Chess," May-Jun 2002.